It's rare to feel like your vote counts for anything, unless you're Iranian, in which case, you actually know that it doesn't. For a vote that does matter, check out Fuzzed Out. 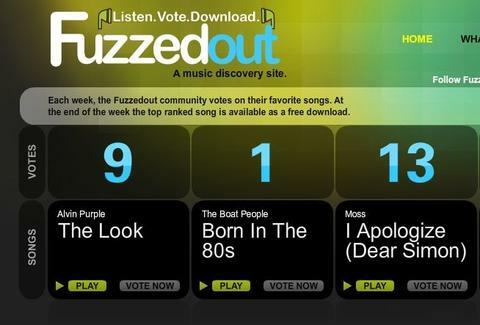 Fuzzed Out's a just-launched music discovery site started by a longtime industry guy devoted to turning you on to new bands via a simple voting system, which is better than a simple voting system of a down, but barely. It works like this: each week, they'll handpick five new songs from mostly-unknown bands; vote for your favorite, and whichever you choose'll immediately be available to download for free, just like the spyware that Nigerian prince needed to put on your computer so he could split millions of dollars with you, as soon as he has all your passwords. Once all the voting's over, the winner'll also be available to download; this week's nominees run international, and include songs from the chick-led British band Alvin Purple, Chicago's Heligoats, and the Australian collective The Boat People, who don't appreciate Kevin Costner's unfair portrayal of their obsession with Dry Land. If you crave more, they've also got a blog featuring live videos of bands they dig and articles about the "old music" biz's sad state, which is a far cry from the 90s whey they iran the town.